Beautiful 2 bedroom/2 bath condo with a gorgeous view of the beach! Your vacation starts right here!! Key Colony Beach and the Florida Keys has everything to offer in the way of island vacations! Sea Isles has completed the grounds renovation 100% from hurricane Irma! It's even more beautiful than before! Sea Isle Condos consists of three buildings. This unit is located in the oceanfront building with an oceanview master bedroom balcony. Our 3rd floor 2 bedroom condo is your home away from home and comes fully equipped with appliances, furniture, televisions...The master bedroom has a king size bed, a full bath and a gorgeous ocean view from the balcony. (Perfect for enjoying your morning coffee!) There is a twin bed and a full bed in the guest bedroom, another full bath and a spacious living room. The kitchen is equipped with all you basic appliances along with dishwasher, coffe pot, toaster, blender...There are ceiling fans and flat screen televisions in every room. You are just steps to the private beach or to the pool. We have a spacious tiki hut with 2 grills so be sure to enjoy your dinner right there while watching the surf! *Please understand that the Keys are still recovering from a devastating CAT 5 hurricane in Sept. We were very fortunate at Sea Isles and mostly had damage to the grounds which is almost all completely restored. Pease note that there is a refundable $300 security deposit which is due upon signing of the rental agreement payable by check or credit card. This fee is not included in your quote, it is a separate fee which will be returned to you upon inspection of the unit. There will be a charge of 12.5% Florida State and Tourism/cleaning tax. The cleaning fee is $125. Our family traveled to Key Colony Beach for the first time in April of 2014. We searched VRBO for the perfect place to spend our vacation and found Sea Isle Condos. We fell in love with the area on the first day. The complex is beautifully maintained, the beach is gorgeous..everything about it was perfect. We spent our next April vacation there as well and decided to buy when a unit became available. That finally happened this year! We spent the month of August painting the unit, changing the bathroom fixtures, we put in all new appliances, new televisions in every room, everything in the condo is brand new. We love it and we hope you'll love it too! We now own a second unit in Sea Isles as of December 2015. Key Colony Beach is a wonderful place to vacation. The area is very safe, very friendly and beautiful. The same goes for Sea Isles! Both bathrooms are full baths. *The cleaning crew will leave 2 rolls of toilet paper in the bathrooms but the guest is responsible for supplying their own after that. Toiletries are not provided. This condo complex has its own private beach for Sea Isles guests only. There are plenty of lounge chairs available as well. Enjoy the private white sandy beach right outside your door! The unit has 2 changes of all linens; bath linens, bed sheets and beach towels. Washing machines and dryers are coin operated and are located outside of the pool in the laundry house. They take quarters only. There is no change machine so we recommend bringing rolls of quarters. Coin operated, located in the laundry house. Quarters only. There is high speed internet and cable in the unit. WiFi and password are located within the unit. Sofa and loveseat as well as a recliner. Flat screen tv. Fully equipped with all appliances: dishwasher, microwave, electric stove/oven, refridgerator. *Sea Isles does not provide paper products for the units. In the guest bedroom closet, you will find some sand toys and a cooler, feel free to use them! There are Sup and kayak rentals available from nearby outfitters. They provide delivery to the complex. Please be aware that there is one designated spot for storing the kayak/stand up paddle boards. Bicycles are available to rent from several nearby outfitters and are available for delivery to the complex. There is a bike rack for storage. Boat rentals are available in Key Colony and in nearby Marathon. There is no boat dock at Sea Isle nor are boat trailers allowed. Key Colony Beach has a small golf course for the public. Sea Isles does NOT have any elevators or wheelchair ramps. There is a heated pool (seasonal) on site for Sea Isle guests only. There are endless opportunities when vacationing in the Keys. You can keep it simple by relaxing on the beach or go all out with paddleboarding/kayaking the many state parks, swimming with dolphins at Aquarium Adventures or visiting the historic homes of Hemingway and Truman in Key West. Fabulous time in this unit. Located in Key Colony Beach, in the middle of the Florida Keys. Allows excellent opportunity to explore the other Florida Keys on day trips. Enjoy the beach, relax by the water or at the pool which are easily accessible. You are located adjacent to all the amenities that the complex offers: shuffle board, pool, barbecue grills, at the tiki hut. Additionally, there are tennis courts and a golf course that are within short-walking distance. Day trip adventures include snorkeling, SCUBA, fishing, kayaking, shopping, and sightseeing. We have been staying in the Florida Keys for many years, and this unit is a great place to stay. Condo was exactly as advertised and was great for our vacation. Would definitely stay there again. We are happy to hear that! Thank you so much and we'd love to have you stay with us again if you return to the Keys. This place was perfect, nice and clean, great for our family of three! The beds were so comfortable and there were beach chairs and umbrellas that we were able to use on our day trips to other areas in the Keys. Sea Isle Condos are very clean and well maintained. Very quiet and peaceful! The beach, grassy lawn with lawn furniture, the pool and the grill area were great. Key Colony Beach is a really nice area with walking paths and sidewalks. I enjoyed Sunset Park and the sunset singers! Havana Jacks restaurant was within walking distance and a great place with trivia night and live music. Sea Isle Condos and Key Colony Beach exceeded our expectations- we loved it! It would have been nice if the condo had kayaks that we could have used while we were there but we absolutely loved everything! Thank you so much for taking the time to leave a review on your stay at our condo. Sunset Park is always a must when we visit the Keys too. It's so nice to just sit there and watch the boats go by. I wish we'd known you wanted to kayak-there are many places where you can rent them and they are delivered and picked up for convenience. If you return to the Keys, let us know and we'll be happy to help you with securing them. Kristin has many brochures in her office as well. Everything was perfect...great week...will be back again. Property was in excellent shape. Loved the grass area where the lounge chairs were located. Million dollar view. It's a million dollar view for sure! We are so happy to hear that you enjoyed your time at Sea Isle. It truly is paradise down there. We do hope you'll stay with us again if you return. We had a fantastic time. Unit location was great. Lots of space. The unit had everything we needed and more. The only complaint, the mattress were a little too soft. We would definitely return for another vacation . Thank you for taking the time to leave a review on your stay at Sea Isle! We hope you'll consider staying with us again if you return. We do have another unit on the property so maybe you can try that one out and hopefully the bed will be more comfortable for you. The Keys is definitely the place to be in the winter months.. always sunny and happy! Have a great day and thank you again for staying with us at Sea Isle. The property was beautiful! We really liked your condo. Close to everything. Sunsets! Water front! We love it here. Just can't say enough about the beauty. I don't want to say anything negative, but the house cleaner could do a better job on the floors and toilets. I'm sorry. But I would stay again. We are always glad to get reviews from our guests about their stay-it's the only way to ensure that everything is up to par and satisfactory. I have addressed the cleaning issue-thank you for pointing it out-since we don't live in the area, we rely on a staff to maintain it for us. We are happy to hear that you had a great vacation otherwise! There is so much to do in the Keys for everyone. 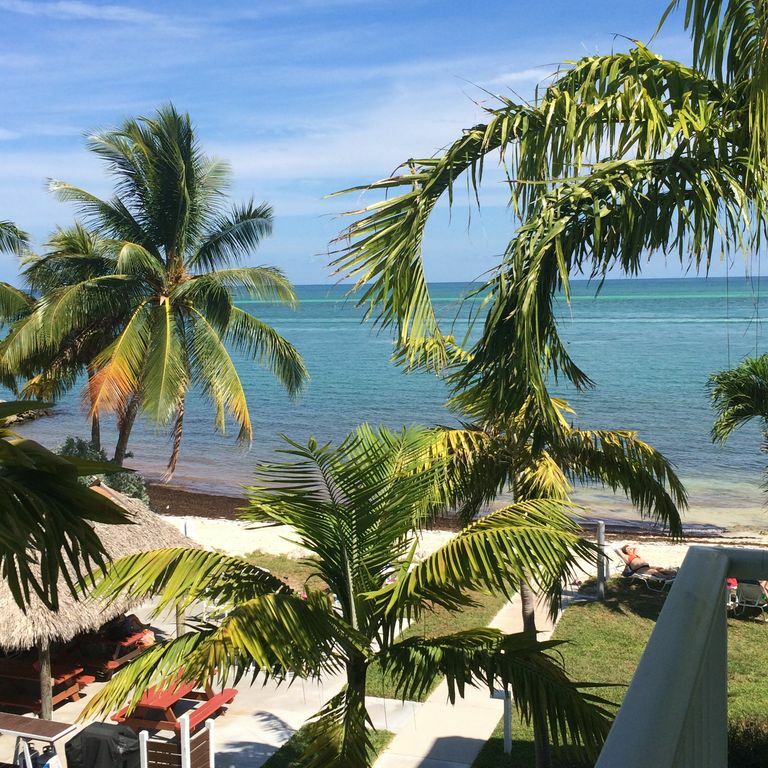 We hope you'll stay with us again if you return to the Keys! Key Colony is a beautiful and peaceful community. Enjoy the tropical breeze right on the private beach or take a swim in the refreshing pool. Nearby Marathon hosts an endless list of adventures for you and your family. There is deep sea fishing, snorkel/scuba trips, paddleboard and kayak rentals and the newly built Aquarium Encounters where you can swim with dolphins and sting rays. There is something for everyone! There is a cleaning fee of $125.00 plus the 12.5% Florida State and Tourism tax. The cancellation policy is as follows: Traveler must cancel 30 days prior to arrival. For rentals of 4 weeks or more, a 90 day notice of cancellation is required. Full refunds will not be made for cancellations later than terms specified above. If less than 30 days notice is given then only the security deposit will be returned. For rentals longer than 4 weeks that receive a less than 90 day notice, the security deposit and any previous payments made will be non-refundable. If you have further questions, please contact us and we will answer them. Thank you.